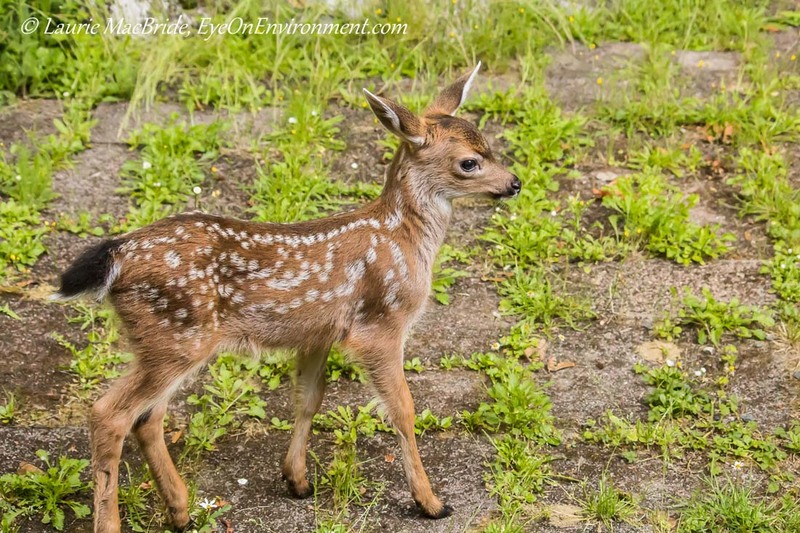 Can there be anything that lifts one’s spirits more than watching a wide-eyed little fawn starting to explore its big new world? I captured these three photos of our newest residents a couple of weeks ago, when they were just two weeks old (click on any of the photos to enlarge). It was the first time their mom, Teardrop, had brought them along on one of her daily visits to our place. We watched from inside the house as the little guy (gal?) above ventured tentatively across the patio stones to keep up with mom. 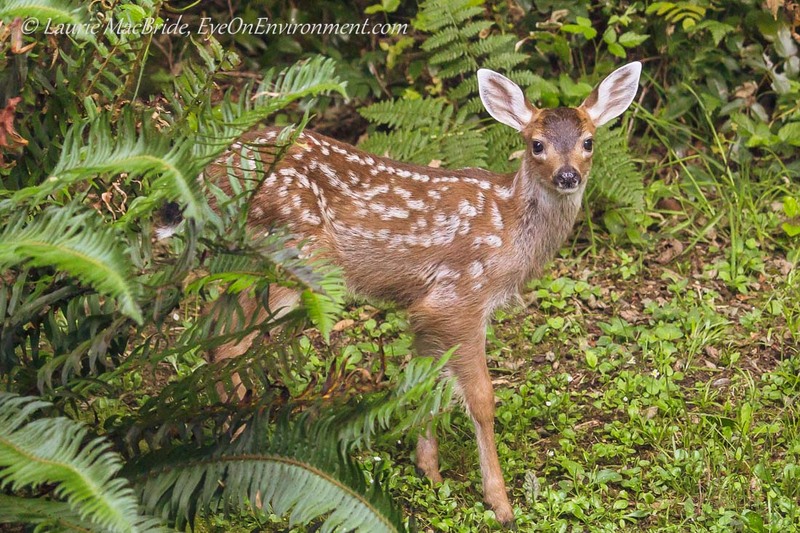 Meanwhile, his/her twin (below) seemed a bit more shy, staying at the forest’s edge until mom returned. Teardrop seems to be patient and attentive to the new fawns, and perhaps a proud mom, too. Now that they’re a month old, they’re visiting a bit more frequently and exploring more of our yard. At this point in their lives, Teardrop doesn’t let them stay for long – a quick frolic, then it’s back to the forest for the tiny twins. But no matter how brief, every visit from these little spirit lifters is a celebrated event at our house. Antlers at Last – and Fast! 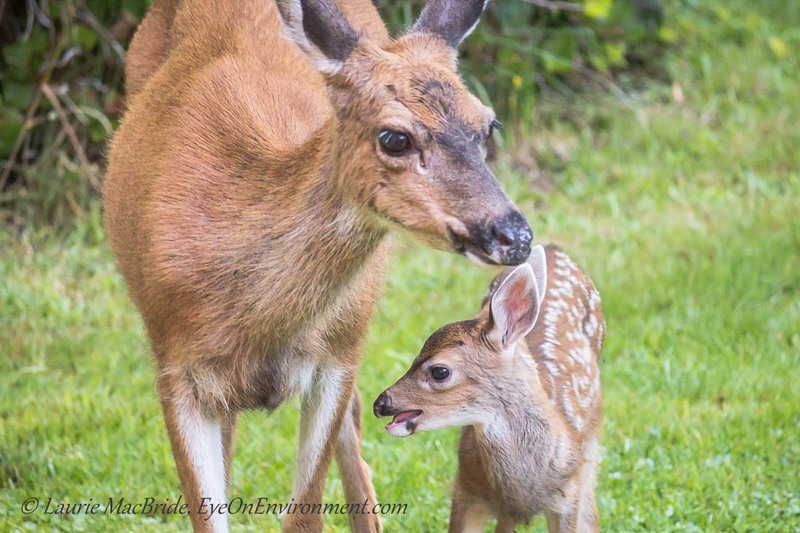 Posted by Laurie MacBride, Eye on Environment on July 24, 2013 in Animals & Wildlife, Mammals and tagged animal behavior, baby animals, deer, fawns, Gabriola, nature, photos, summer. They are absolutely precious, and how fortunate you are to be able to photograph them. Thanks for the comment, Lisa. Yes, we are very lucky. They visited again today, briefly – still as cute as can be!. Love how you call them spirit lifters, Laurie! They melt my heart…you have captured them with your camera so tenderly and beautifully. Lovin’ this set, Laurie, those cute little additions to the family are a real joy to take in! Thanks, Toad – yes, they are indeed. One of them was around again this morning with momma – lovely to see. Thanks for the visit & kind words. Love the middle photo! Great job Laurie ! What sweet creatures … ! Hope you and yours are having a lovely summer ! Awww…so cute, you gotta love them! They are cute, for sure – of course it’s quite a different kind of “cute” than the gators you’ve been posting lately, which are amazing! Thanks for the visit & comment, Phil.